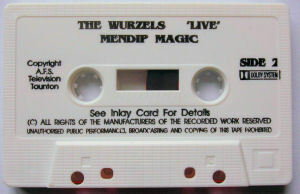 As far as we can tell, Mendip Magic 'Live' was only ever released on cassette. 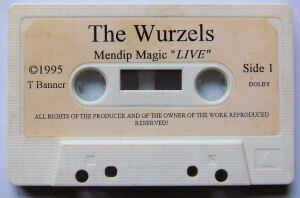 It is a live album with the Banner-Budd-Morgan-Wintour line-up, and looks to have been released in 1995 which was the year that Dave Winter joined the band. 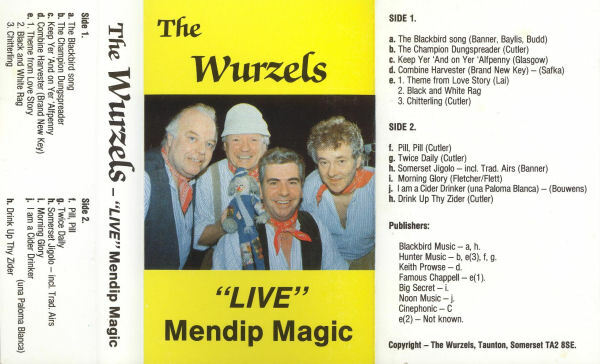 One can imagine that this was released to showcase the band playing with their 'current' line-up, and may have only been sold at Wurzels shows. This appears to be the only officially released material with Dave Wintour playing. There are two releases of this album. The first is undated, and is copyright to AFS Television, Taunton. The album was later re-issued by the band, and has the copyright (c) 1995 Tommy Banner. 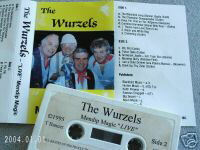 For both releases there is no mention of any record label being involved (not even The Wurzels own label). 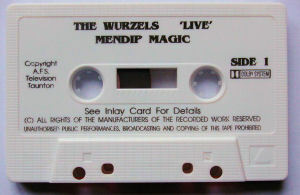 The different releases are obvious from the cassette labels (see below), although the cassette sleeve is identical for both releases. We have been unable to find any information about AFS Television, Taunton. The titles of the songs above listed are as they appear on the sleeve - so The Blackbird becomes The Blackbird Song, The Champion Dung Spreader becomes The Champion Dungspreader. 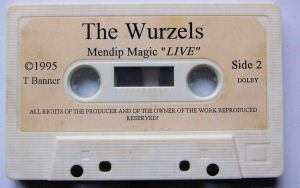 And I'm not even sure if the title is Mendip Magic 'Live' (as the cassettes state) or 'Live' Mendip Magic (as the sleeve states) - not that it matters much!